Tim Tyler forwarded some more photos this morning of NB Oleanna up to the gunnels. The rounded section is the stern most of which you can see when a boat is in the water, Below where it comes to a point is called the swim. At the point is where the drive shaft comes through from the engine and turns the propeller. The two skimpy legs are just there to support the overhanging stern during construction. On the top edge there is a notch which is there to drain rainwater from the stern. On our current boat we don’t have one of these, rainwater has to drain down into a trough around the edge of the engine bay. This is a view looking from the other side of the stern. Nearest the camera is one end of the engine bay. Forward of this is the interior of the boat. At the bottom is the engine mount. 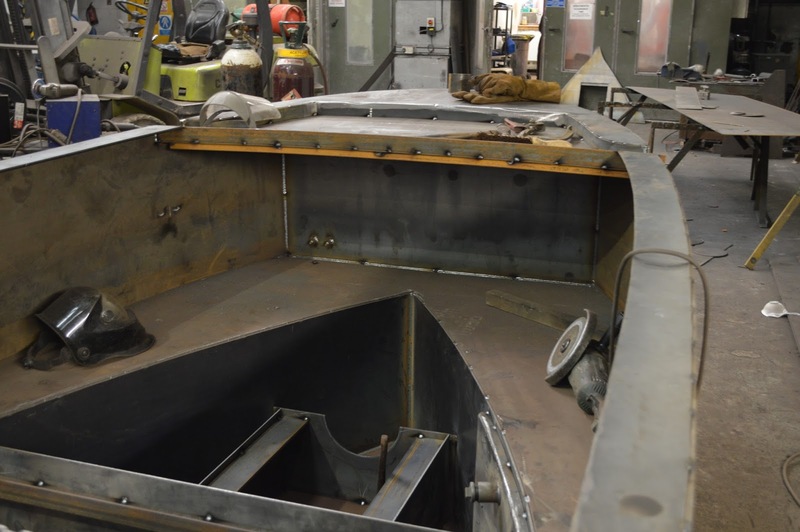 To the right of this is the skin tank, this is used like a radiator in a car to cool the engine, the water itself is cooled as the tank is on the swim of the boat under the surface of the canal water. The flat area is where things like the calorifier (hot water tank) and batteries will be positioned. The flat upright (we think) is the front face of the fuel tank. This tank will go to the rear of the stern around the weedhatch. On Tyler Wilson boats access to the weedhatch is not through the engine bay, as it is on may boats, but it is kept seperate. This means that if you don’t secure the lid to the weedhatch properly then you won’t flood your boat when the prop gets going. The weedhatch gives you access to the propellor so that if anything has fouled on it (carpets, plastic bags, coats, rope, occasionally weeds) you can clear it. There is a tube right at the rear of the stern, this is where the rudder post will go down through the stern and attach to the rudder. 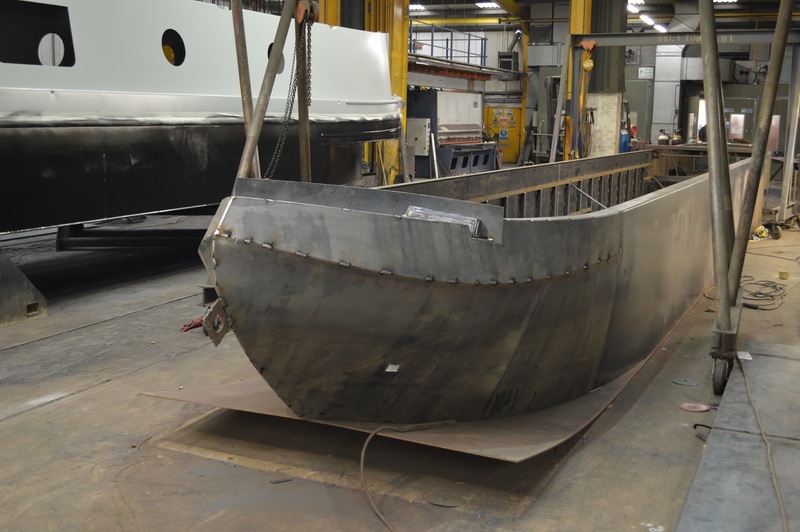 The sides of the hull are made up from two lengths of steel, you can see the weld line which is paler than the sides and stiffeners. An extra stiffener has been added to give more strength where the two sheets meet. 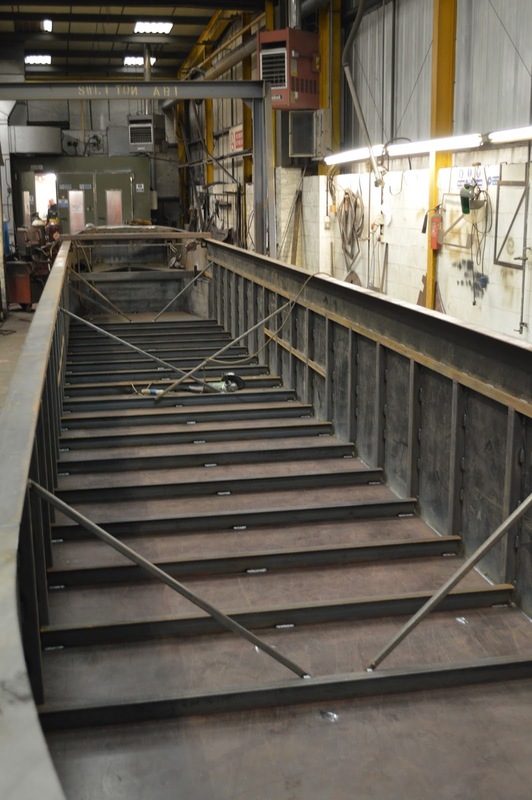 The diagonals are used to hold the sides in position whilst they are welded to the base plate. 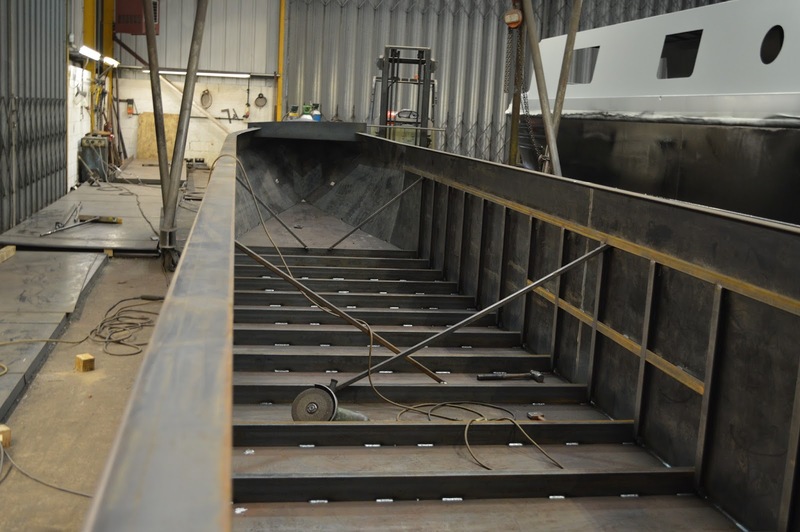 They also help the hull keep it’s shape and strength until the cabin is fitted above. The inside shape of the bow can be seen with the sides curving in along with the baseplate curving up. Here you can clearly see how the bow baseplate curves upwards. 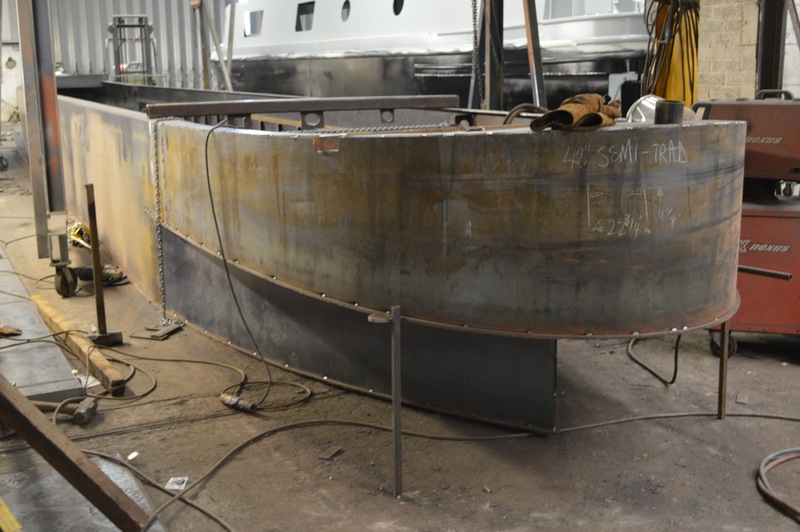 The shaping of the bow has been spot welded into position. This shows the stiffeners and diagonals well. Along with receiving these photos today, we have had conversations with Julia regarding the shape of the front lockers. As we are having a Trad bow our bow thruster will be positioned under the well deck, so access to it will be through the floor of the deck. The battery will be housed in one of the lockers. The positions of the windows needed to be confirmed before the apertures could be cut. We have my original drawings and I hadn’t written the dimensions between the windows on the plans. So this morning I spent sometime measuring the original drawings, double checking and emailing the details to Julia. Jonathan does have copies of the plans, but as they have been scanned and printed out they may have been distorted in the process. Their positions have had a lot of consideration with relation to built in furniture, so an approximation wouldn’t look right. So best measure twice and cut once. This entry was posted in Uncategorized on 4th Apr 2016 by pipandmick.